We need to plan for Wisconsin’s energy future. We can choose to be at the cutting edge of new technology and energy systems, or we can fall behind by choosing old, clunky, toxic sources of energy. We need to choose a course that is reasonable for our pocket books and creates new competitive Wisconsin industries, helps clean up our environment and health, and increases our security. Creating a completely renewable energy system—carbon-free and nuclear-free—is both technically and economically possible, and it is the best choice for Wisconsin ratepayers, taxpayers, and citizens. Why Eliminate Carbon Dioxide Emissions from Fossil Fuels? Climate affects us all—in terms of our health and our well-being. The earth’s atmosphere and ecosystems are interconnected, delicate and complicated. The effects of climate change have the potential to break this system, and our system of global economy with it. We need to act now and plan for zero carbon dioxide emissions from the energy system by 2050. The heat-trapping gases we emit today will continue to warm the earth for hundreds of years, so we need to act now to have the best chance at controlling the problem. Even the Pentagon is worried about climate change due to its potential to heighten uncertainty and costs, while triggering mass migrations and increasing poverty, misery, and illness. The federal government is in the process of putting a price on global warming pollution, and the Wisconsin state legislature is considering how Wisconsin will deal with that pollution. The federal price on carbon will begin affecting coal and oil prices in the next few years, so we need to plan for alternatives now. Nuclear energy is dirty, dangerous, and expensive. Nuclear energy creates radioactive waste that lasts essentially forever. There is no good solution to this problem, and some of the radionuclides in nuclear waste (notably iodine-129 and cesium-135) are radioactive for millions of years. To date, no country in the world has been able to successfully develop a geologic repository for high-level radioactive waste. Reprocessing is not a solution to nuclear waste either, as the case of France has shown. While some have said reprocessing “recycles” the waste, this is less than 1 percent true. Reprocessing separates plutonium, which is about 1 percent of the nuclear waste, from the rest of the nuclear waste so the plutonium can be used as a fuel in reactors. The other 99 percent of the nuclear waste is not used. In order to use the 1 percent plutonium as fuel, France pays more for the electricity produced from plutonium. France also discharges roughly 100 million gallons per year of radioactive liquid waste into the English Channel, which has contaminated the seas all the way to the Arctic Ocean. Nuclear power also entails risks of nuclear proliferation, terrorism, and accidents. Increasing nuclear power will increase these risks and threaten our security, while decreasing and eliminating nuclear power will increase our security. Finally, nuclear power is expensive and investing in it is financially risky. It is already more costly than wind energy at good locations. Recent industry and Wall Street cost estimates range from $5,000 to $8,000 per kilowatt, putting the per kilowatt-hour cost of nuclear energy of 10 cents to 17 cents. The costs can be compared to 8 to 12 cents for wind and 10 to 14 cents for concentrating solar thermal power today. Nuclear energy investments are also so long term, so high in cost, and so inflexible once made that they are very risky in a financial crisis. Wall Street understands this–the same Wall Street that promoted subprime mortgage bundles as safe investments thought nuclear power was too risky even before the financial crisis. We must understand that investing in nuclear is so expensive that it will foreclose cleaner, safer, less risky options at the same or lower cost. Nuclear energy supporters in Wisconsin are arguing that we need to “keep all the options on the table.” We all like choice, but we need to remember how economics work. We have all been to the store with a limited amount of money. If one of the items in our shopping cart consumes most of the money we have, then we will not be able buy everything on our list. Nuclear energy is that high price item—and it is not good for us. There is a campaign underway to open the door to more nuclear reactors in Wisconsin. Learn more and get involved in stopping more nukes here. 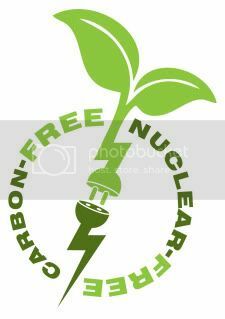 We can go carbon-free and nuclear-free with a sound energy policy that is committed to efficiency and by investing in new, clean sources of energy, and a smart grid. The technology is here today: if we set a course for renewable energy and begin working towards it, we can be carbon-free and nuclear-free in the next three to four decades. Going Carbon-Free and Nuclear-Free can create new competitive industries. Industry leaders as diverse as the head of BP (the former British Petroleum), the head of Ford Motor Company, and the chief scientists for the electric power industry all agree that in this century we will see a transition away from fossil fuels such as oil, coal, and natural gas. No new nuclear reactors have been ordered and built since 1973, and nuclear energy will die without massive government subsidies. In contrast, the solar power industry is growing at 25% per year (and is expected to expand even further), and the number of wind installations worldwide has grown at an average annual rate of about 40% per year. The question is whether Wisconsin will be at the forefront of the transition and reap the benefits or will trail behind, or choose the wrong path, and miss out. Letter from WNPJ co-chairs to governor and legislature: Don't relax nuclear plant rules. News release. Coalition of 12 public interest groups urges governor and legislature to oppose nuclear power. Letter. George Wagner op ed column: We should say no to coal. Al Gedicks op ed column in Green Bay Press Gazette: Nuclear power is a false solution to climate change. Peter Bradford op ed column: Massive nuclear subsidies won't solve climate change. Clean Wisconsin: Wisconsin: The Next Yucca Mountain? An op ed by WISPIRG's Bruce Speight: Nuclear power is too costly. Xoff Blog: Nuclear industry targeting Wisconsin. Op ed column by Al Gedicks of Wisconsin Resources Protection Council, Nuclear myths are challenged. All costs are at the generating station, does not include any costs for nuclear above present waste management costs, even though there is no solution to the problem of nuclear waste.